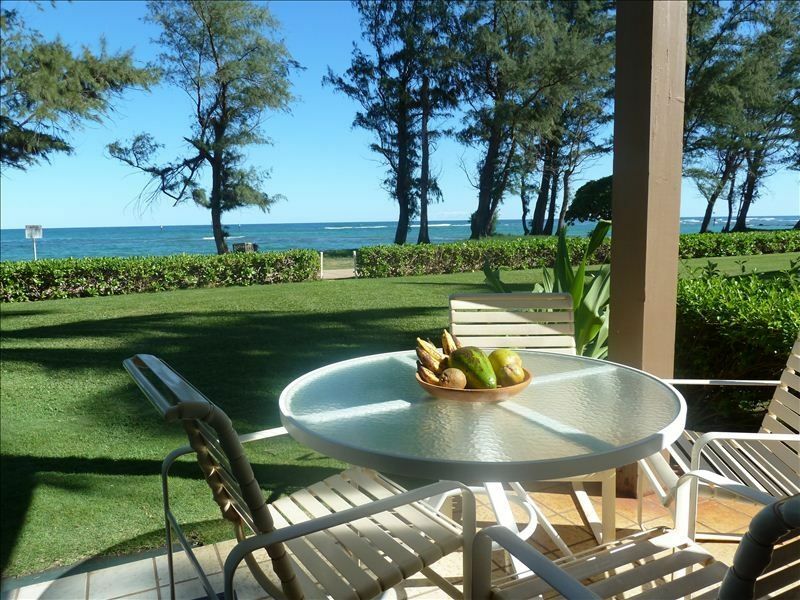 Kauai 2 BR / 2 BA Condominio Oceanfront - Pono Kai Resort! Godere di bellissime albe e tutti i lussi che accompagnano vita sulla spiaggia. Questa due camere da letto condominio al piano terra in Pono Kai è passi da una spiaggia di sabbia miglio-lunga. Questo bel condominio è di proprietà privata, curato, e apprezzato da noi per nove anni. Siamo orgogliosi della qualità e l'arredamento della nostra casa isola. Le due camere da letto, due bagni condominio ospitare comodamente due a sei persone. La camera da letto principale ha un letto king-size, la seconda camera ha due letti singoli e un letto queen-size divano letto è nel soggiorno. E 'ben attrezzata con piatti, pentole, lavastoviglie, forno a microonde, aria condizionata e TV via cavo. Servizi di lavanderia sono disponibili nel complesso. Vedere votare e disponibilità delle informazioni qui di seguito. È richiesto un deposito di $ 150 per prenotare le date. Chiamata o e-mail per informazioni sulle attività di disponibilità e insulari. Absolutely loved being so close to the ocean! So relaxing to sit and enjoy such a beautiful view. Even saw whales off in the distance. It was nice to be in Kapaa, rented bikes, and enjoyed the quaint shops. It's a nice central area to be, making it easy to travel to either side of the island to explore all the sights. If location, sunrises, and oceanfront are your priorities, this condo is perfect. The only thing between you and the water is the coast trail for walks and biking. "Downtown Kapaa" is only a couple blocks away making it easy to stroll the shops or walk to dinner. Ono Ono shave ice is right across the street - definitely recommended - and top it with Li Hing Moi (lee hee moy). We sat on the lanai every morning with coffee to watch the sunrise!! The owners are very responsive - the coffee maker had an issue and we had a new one delivered that afternoon. There are other reviews that reference bugs and cleanliness - my comment on this is that 'this is the tropics!'. I have been visiting Kauai/Kapaa almost annually for the last 40 years, and this condo very much represented what I expect from a hawaiian condo. It is not a 5-star resort, I wouldn't want it to be! I would definitely rent this condo again! We stayed at Pono Kai last year and wanted to stay there again because of the location and the resorts amenities (pool and hot tub specifically). It was difficult to get into this resort and found this 2 bedroom unit when we only wanted a 1 bedroom unit. We liked it was on the first floor and being ocean front, definitely selling points. It is a very large unit with generous room sizes. The unit itself needs an updated kitchen and newer furniture (stained and older). The bedrooms and baths are decent. The unit manager (Grace) is very accommodating and willing to do what she can. I did give her feedback I thought would be useful and she seemed receptive. If you have any problems, start with her first which I did not so that was my fault. Had limited extras like beach towels, coolers, beach mats, but no chairs for the beach. We stayed a week & the view was great. Also, the facilities had a lot to offer such as a BBQ. We have rented several condos thru VRBO. We enjoyed the condo but thought that they could have provided more amenities such as hand soap, etc. Also, the spare bedroom needs a ceiling fan and/or air conditioner vents as the room was very warm. This is a decent place to stay if you don't want to spend a huge amount of money. The location is pretty good, and it's a nice view from the lanai (though the beach isn't really a swimming/laying-out kind of beach, and there are some homeless encampments off the trail nearby). There are some cute shops and local restaurants just steps away, which is really helpful when you don't want to drive somewhere. The condo itself is in dire need of updates. The bathtub drain is corroded so you are forced to take a shower (my mom likes to take only takes baths) and the place wasn't particularly clean (dust bunnies hanging from the ceiling, dirty lamps, smudges on the glass doors, dead bugs and geckos in the light fixtures, floor gritty when we walked in and took our shoes off as requested). Almost everything looks like it was original to the condo or updated back in the 90's. The cushions on the furniture were stained. Basically it seems like a place that the owners use mostly as a rental and just do the bare minimum to get by with what they charge. I know it's also hard to do quality control with the cleaning when they are in California. We also had a confusing time with the check out - in one place it said check out was 10am (which is pretty early as far as check-outs go) and another place it said 11am. When I asked the owner through a message about the discrepancy a few days before checkout, she never responded. Then the last day we figured we would get ready to go by 10am just to be safe, and at 9:55am there was some guy knocking on our door telling us we had to leave in 5 minutes. A little unprofessional. There are SO many other rental options on the island that I think for next time we'll look for a different place - we wouldn't stay here again.